The man to finally surpass the two-bar brewing barrier was Milanese café owner Achille Gaggia. Gaggia transformed the Jules Verne hood ornament into a chromed-out counter-top spaceship with the invention of the lever-driven machine. In Gaggia’s machine, invented after World War II, steam pressure in the boiler forces the water into a cylinder where it is further pressurized by a spring-piston lever operated by the barista. Not only did this obviate the need for massive boilers, but it also drastically increased the water pressure from 1.5-2 bars to 8-10 bars. The lever machines also standardized the size of the espresso. The cylinder on lever groups could only hold an ounce of water, limiting the volume that could be used to prepare an espresso. With the lever machines also came some some new jargon: baristas operating Gaggia’s spring-loaded levers coined the term “pulling a shot” of espresso. But perhaps most importantly, with the invention of the high-pressure lever machine came the discovery ofcrema – the foam floating over the coffee liquid that is the defining characteristic of a quality espresso. A historical anecdote claims that early consumers were dubious of this “scum” floating over their coffee until Gaggia began referring to it as “caffe creme“, suggesting that the coffee was of such quality that it produced its own creme. 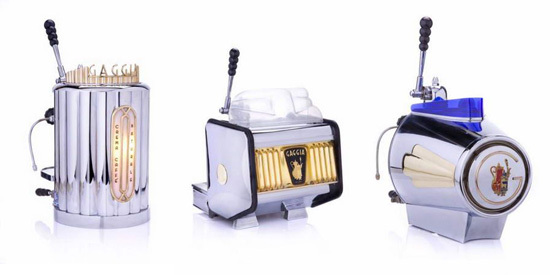 With high pressure and golden crema, Gaggia’s lever machine marks the birth of the contemporary espresso. By the way this is the 2000th Cheap Talk post. Congrats! That’s quite a few posts. Hey hey hey! it’s been a lot of fun. Keep up the good work! One of my favorite blogs, thanks! I would like to say that this write-up very compelled me to check out and do so!